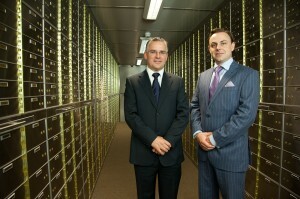 Liverpool Vaults is part of Europe’s largest independently owned safe deposit company. With additional vaults open in Ireland, Scotland and England. We provide custodial services to private individuals and businesses, allowing them to safeguard their most valued possessions in a secure state-of-the-art purpose-built vault. We are situated within minutes drive of Liverpool Central station. Our aim is to provide a unique and first class service to our clients, ensuring the safety and security of their most valued possessions, documents and jewellery. Liverpool Vaults & Merrion Vaults were founded by Séamus Fahy and David Walsh.